The sailing season is again drawing to a close – unfortunately. I have read many of your ‘adventures’ in my inbox, on social media or have heard them personally of course in our showroom. We have been enjoying ourselves sailing with “Henri Mer”, our 40.0 AC. Even though we didn’t go far, it was great fun. We started at our favourite beach in Kessenich, stayed a few days in Roermond, before heading for Well. We eventually found a mooring at holiday village Leukermeer in Well where we stayed for a few days. It was great for the children, there is a beach, water, an indoor swimming pool and loads of things to do. In other words, a real holiday. The nice thing about a boating holiday is that you never have any really bad weather. You are always outside when it’s dry. Every time the rain stopped, Mathijs and Sophie were on the jetty with their fishing nets. When I asked them to be careful, Sophie’s (3) standard answer was ‘Nothing can go wrong mama, because I have my life jacket on.’ You could say that’s also a way of looking at it. A new activity for them was sailing with the dinghy (with us of course). A real adventure. You discover places that you cannot reach with the ‘big’ boat or you can sail ashore if you are anchored. The children now know what the dead man’s switch is, what its purpose is and always put in on if they are allowed to steer. We also came across several Linssens on the way. For instance, we moored next to the “Pic du Soleil” (36.9 AC), the “Fleur” (29.9 AC Traveller) and waved on the water to the “Girah” (410 AC Variotop), the “Aurora” (34.9 AC) and the “Louise” (25.9 SCF). It’s always nice to greet other enthusiastic Linssen boaters. In marinas too we were often spoken to by people with another boat. We received many compliments, and needless to say we are very proud about that. We have already started preparation for our 2017/2018 boat show season, during which we will be presenting part of our new Grand Sturdy series. A lot of hard work is being devoted to the new 45.0 AC (follow our VLOG) and the spectacular Grand Sturdy 500 AC Variotop®. You can come and view these new models in our showroom in November. “Henri Mer” is staying in the water for the time being, for us, but to some extent for you too. To experience the new 40.0 AC, you can make a test sailing with her. If you are interested, get in touch with one of our national or international dealers or your contact in Maasbracht. 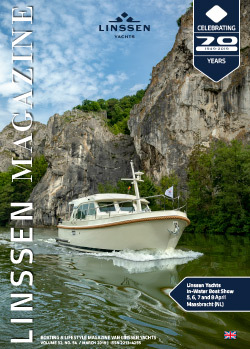 We hope to welcome you soon to Maasbracht, with the Linssen Yachts Boat Show from 18 to 20 November, inclusive, being the final opportunity.